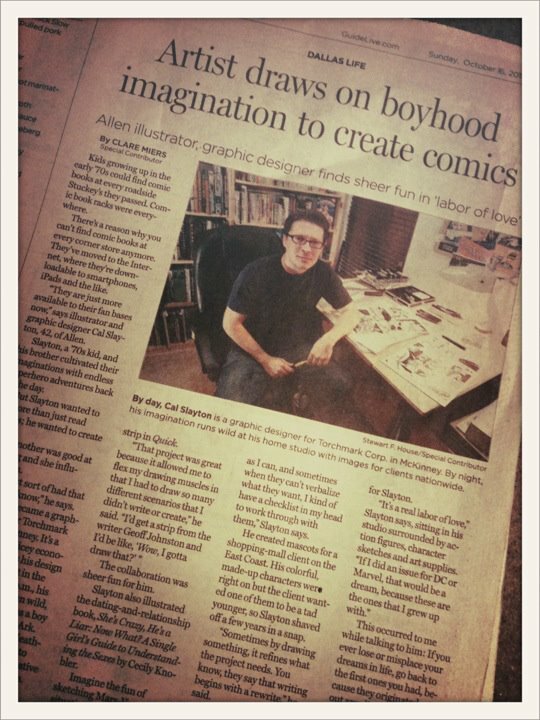 cal slayton | illustrator | graphic designer | comic book artist | dallas | dfw: Hello Dallas Morning News! I was very fortunate and flattered to have writer Clare Miers ask to do a feature in the Dallas Morning News on me and my work. The story was printed today in the Arts & Life section of the Sunday edition. It came out great, I'm really happy with it. Thanks to Clare for the tremendous opportunity and for making me look good, which is no small feat. If you just found me online from reading the story, please look around. If you need illustration or design work please feel free to contact me. My email is contact [AT] calslayton.com If you look at the menu bar on the right there are other places online that we can connect if you're interested. Thanks for stopping by!